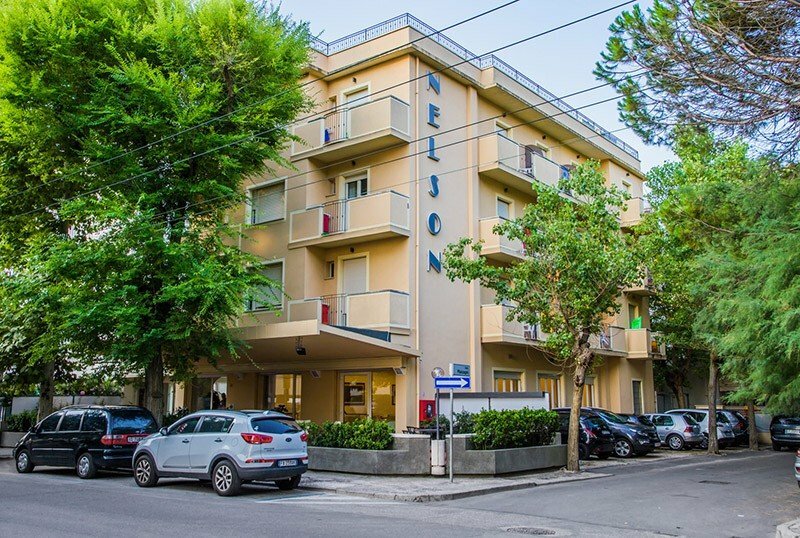 The Hotel Nelson , a 3-star family-run hotel in Riccione, offers services for children, WI-FI and parking. Admits small pets. The hotel is located in Riccione, a minute's walk from the beach and a couple of minutes from Viale Dante. STANDARD: recently renovated, with balcony (if included in the package), sea view, soundproof windows, electric shutters, individually controlled air conditioning, beds with slats, private bathroom with shower and heated towel rails, hairdryer, LCD TV 24 ", WI- FI, telephone and safe.A single rooms (without balcony), double / twin, triple, quadruple rooms available. FAMILY: with the same services as the "standard" rooms, they have an independent entrance and ample space to accommodate even the most numerous families. Open-air porch, lift, TV room, air conditioned dining room, themed evenings, heating. On request: laundry service. PARKING: uncovered upon payment, while seats in the hotel and outside at 1.5 km by shuttle. WI-FI: available throughout the entire hotel. AIR CONDITIONING: present in the room and in the common areas. SERVICES FOR DISABLED: entrance with inclined ramp, lift for disabled people, rooms with wheelchair maneuvering space, bathroom with shower accessible. PETS: small pets allowed, even at the beah affiliated with the hotel n. 100. BREAKFAST: buffet with homemade cakes and savory proposals. LUNCH AND DINNER: local cuisine with 3 choice menus followed by a buffet of hot and cold appetizers. Water, wine and soft drinks are included in the all-inclusive formula. Pasta and desserts are homemade. VARIATIONS: menu for vegetarians and celiacs. In the hotel: seats, strollers. In the room: cots, camping beds, safety rails, night light, baby baths. At meals: high chairs, plastic cutlery, baby food and baby menu preparation. On the beach: live entertainment, playground. Hotel Nelson has an agreement with the Bagno n. 100, which in addition to beach umbrella and sunbeds, hot showers, playground, live entertainment, also accepts pets.